Save this file to your hard drive. I know this table is basic but it will serve our purposes for this tutorial. Once you get the basic understanding of how this works you can then use your own drawing register to suit your needs. From here, we are going to insert the Excel table into AutoCAD using the Data Link Manager. The next window to pop up is asking for an excel file to link to. Click on the three ... (Shown red in Fig.5) and goto where you saved the Excel file you downloaded. 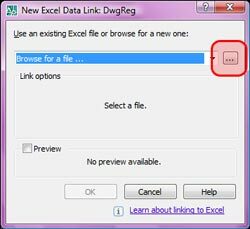 Select the file and click OK.
Now in the next window that appears, select Link to Range. 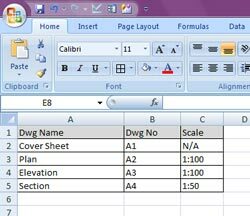 This gives us the abilty to select only certain parts of the Excel workbook instead of the whole sheet. If you are familiar already with Excel, this next step should make sense. If you look back at the Excel spreadsheet in Fig.1, we have data starting from Column A Row 1, and finishing at Column D Row 5. So basically we have told AutoCAD to select all data between these ranges meaning everything currently shown. Once done Click OK, then Click OK again to close Data Link window. 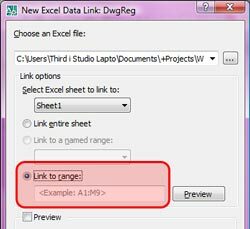 We have now set up a link between our Excel Workbook and AutoCAD. Now we just need to insert it into AutoCAD as a Table. To insert a table into AutoCAD, goto DRAW > Table from the menu bar. The Insert Table window appears. Once selected Click OK. You are now prompted to select the insertion point for the table. Place it anywhere you like. You have now created your first Table with the data link connection. 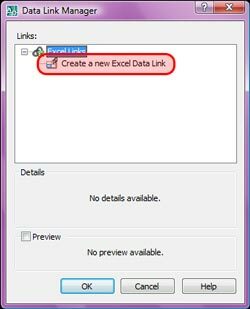 when you go back to AutoCAD you will be prompted to update data links. The table will now change to reflect the alterations made to the excel file. 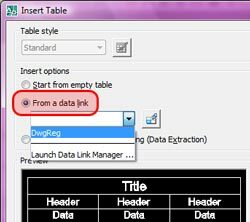 This tutorial was a basic look at the table data link, there is much more that can be done in terms of formatting your tables.